I am FOREVER GRATEFUL to be apart of Camp Reveille! I began this experience 13 years ago simply wanting more experience within the field I was pursuing. I interviewed for a Summer Day Camp position but later received a phone call saying all spots were filled but there was a spot available for Camp Reveille. To say the least, I had no idea what Camp Reveille was about. I didn’t really know what I had gotten myself into. My first year was an experience I will never forget. There were moments shared, clothes and shoes given away, but the best part was leaving with a bond that I had created with six girls I had never met. I was able to talk and laugh with them, love on them and share God’s word. Most importantly I felt I had given them hope. Hope to be a better student, a better daughter… Hope to be successful….. Hope to know that they can defy the odds. jasmin baker 2In 2011, my role transitioned to the director of Camp Reveille and it has been one of the most rewarding experiences of my life. I have to be honest, I did not think I was capable of such a task. I will definitely have to to give credit to Jill Sloan for not giving me an option to say NO! God has given me this opportunity, which has exceeded any expectations that I have had for myself. A statement I always use with my counselors is that…. 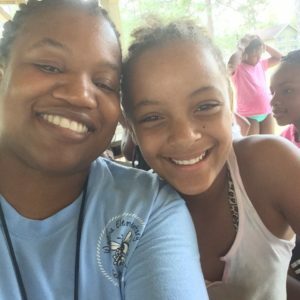 “You never know how fortunate you are until you have experienced Camp Reveille.” So often we as parents or guardians take for granted the little things in life such as telling our children we love them, listening to their stories, teaching them how to be respectful, responsible, honest, and caring. But I have gained so much joy being able to lead daily devotions, sitting out on the picnic table in mid June listening to “my favorite part of camp” stories, and getting that one special hug and I love you after an adventurous day after Summer Waves. Many ask why do I continue to come back year after year? Often it is just a single memory of being in a room with 90 to 100 children on a Tuesday evening or Friday morning, watching with tears rolling down my face, these precious babies worshipping and pouring out to God, definitely not ready to go home……… for this I am FOREVER GRATEFUL for Camp Reveille.